Despite his fame as an important figure in 20th century poetry history, Paul Éluard also produced a few drawings during his early age. We found that many differences and some similarities exist between his artistic and literary efforts. Paul Éluard, Le Cirque, 1913, wax crayon drawings. Courtesy of Gallery Rosenberg & Co.
For those who have heard of Paul Éluard, the first thing coming to mind is surrealist poetry. Indeed, Éluard owes his popularity to the verses he wrote while in contact with the French avant-garde, even though he was sometimes seen as an outsider in the circle of André Breton, both politically and artistically. In addition, not many know that Éluard was also an occasional visual artist, and a few drawings and paintings by him remain today. We came across one of Éluard’s artworks on show at Gallery Rosenberg & Co during the last edition of the antique fair in Brussels BRAFA. Its title is Le Cirque (the circus) and dates back to 1913, when the poet was 18 years old. It consists of three wax crayon drawings on paper mounted on panel forming a triptych. It depicts human and animal-like figures in a rather abstract environment, with a large palette of colours yet dominated by the warm brown hue of the paper. 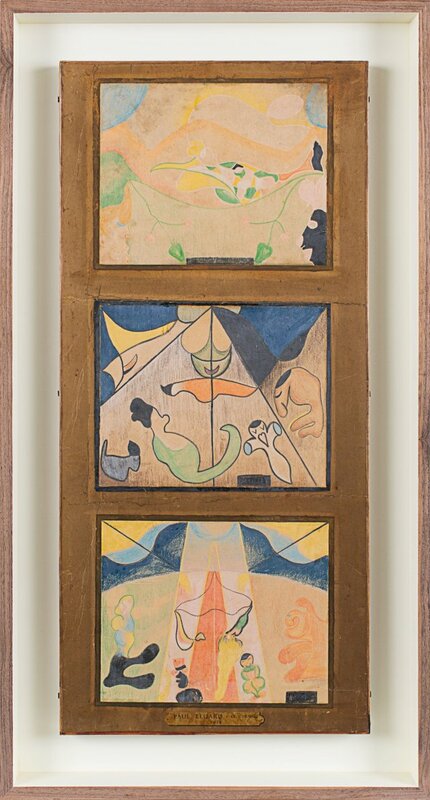 The triptych was made during Éluard’s stay at a Swiss sanatorium in Clavadel, to which he was committed a year earlier due to a lung infection. It might have been inspired by a circus visit in the nearby Davos, or by photographs, or his childhood in Paris. It is formally very appealing and it reminds of later works by Miró: the variegated palette, the stylised and rounded depiction of living bodies in a flat environment typical of child scribbles, and the thick black outline of the figures. Moreover, there is a strong formal charge coming from the unfinishedness of the piece, a roughness that doesn’t merely remind of the inexperience of the artist, but brings up an aesthetically interesting contrast between the neat marks and the blurry patches of colour coming from said crudeness. Paul Éluard drawings and his poetry. Scholar Max Adereth says that three main themes are found in Éluard’s poetry: love, brotherhood, and kindness. Somewhat surprisingly, none of these are directly depicted in Le Cirque, and the poems from the same period are quite distant from the triptych, both in terms of content and form. It is as though the young Éluard could express some of his thoughts only through the visual medium, leaving the written word for different explorations. Perhaps the only moment of contact between the drawings and a poem from the same period is found in Sourdine (1914), in which Eluard exhibits a certain movement between the three stanzas, not completely unlike the rhythm between the three drawings. Like the lead of the plumb-line. Besides few examples like Flight, no much poetry by Éluard seems to come close to his drawings. Even though works from his Surrealist period have indeed hints of fantasy and experimentation that resemble the elements of Le Cirque (see for example a famous verse from the collection Love, Poetry (1929): “The earth is blue like an orange”), most poetical efforts by Éluard remain faithful to logical links of words and rather clear figuration of images. Even more after his break with Surrealism, Éluard’s poetry never seemed to make the artistic choices of his young visual experiments. In a way, nothing feels more distant from Le Cirque in the poet’s body of work than the politically engaged poems he wrote in the 1940s and 50s. Older age and dramatic life experiences of two world wars are of course good elements to explain the differences between Éluard’s early visual art and his poetry. Yet it is interesting to note that many artists have made radically different artworks when changing art form. The recent exhibition A Different Medium at Rosenberg & Co. gallery showed a few examples from the 20th century (including Le Cirque), but we can also recall the bright and colourful paintings by otherwise rather comfortless poet Sylvia Plath, or the straightforwardly funny poems by Yoko Ono collected in her Grapefruit, which somewhat break from the brainy sense of humour of the artist’s conceptual work. In conclusion, it is safe to say that Éluard’s triptych Le Cirque deserves recognition as a relevant artwork per se, despite the fact that it is not located within a well developed visual practice by an accomplished artist. 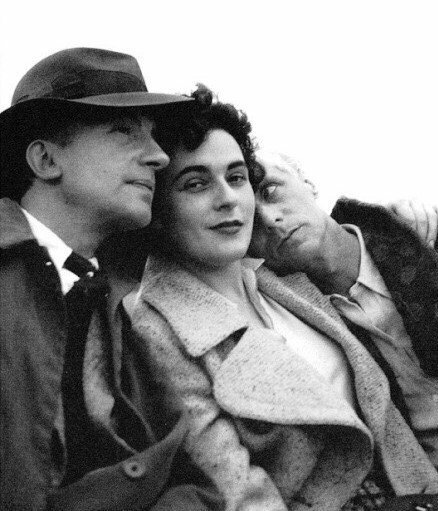 At the same time, it cannot be considered as merely a lucky accident and curiosity by an outsider artist, since Éluard’s fame in the history of 20th century poetry is hard to deny. To some extent, this single drawing triptych seems so out of place that it acquires more of a contemporary look than its author’s poetry, which remains rather linked to the time when it was composed.